November is here with many parts of the country are already feeling the chill. This weekend, a nor’easter dropped up to 20 inches of snow in cities along the eastern seaboard — a reminder that winter is coming. 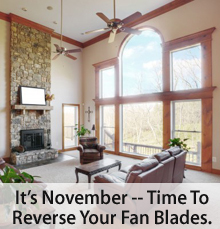 No matter where you live, though, the seasonal change in temperature throughout Manhantten serves as an excellent reminder to reset the blades on your home’s ceiling fans. Ceiling fans don’t warm or cool air, specifically. Instead, they circulate air which can have the effect of making a room feel warmer in the winter months, and cooler in the summer months. When it’s cold outside, ceiling fans push warm air down from the ceiling, balancing the heat within a room. This can make a room feel 4-6 degrees warmer. Then, during warmer months, ceiling fans push a room’s cold air back into circulation, which creates a windchill effect, of sorts. This, too, can change a room’s temperate 4-6 degrees. The secret to a ceiling fan is in the rotation direction of its blades. When fan blades rotate counter-clockwise, the fan make a room feel cooler. This Weather Channel video explains how it works. If your home is without ceiling fans, consider installing one (or more). Ceiling fans are economical and “green”, using the equivalent energy of a 100-watt light bulb, while lowering your home’s energy costs. Plus, they’re relatively simple to install. Tutorial videos are available online for the do-it-yourselfers, or just call a qualified electrician for assistance. Installing a ceiling fan is a 1-hour project. Nationwide, fewer homes are going under contract to sell. According to the National Association of REALTORS®, the Pending Home Sales Index fell 5 percent last month. September marks the fourth consecutive month in which the index has dropped. The Pending Home Sales Index is a monthly index which measures the number of homes under contract to sell, but not yet closed. As such, it’s among the few “forward-looking” housing indicators; a data set meant to predict future home sales. 80% of homes under contract close within 2 months so, if the September Pending Home Sales Index is to be believed, we should expect home sales to decline through October and November. And that’s before we account for cancelled contracts. Also from the National Association of REALTORS®, we learn that 18 percent of homes under contract failed to close in September. This is double the failure rate from September 2010 and it, too, should drag Existing Home Sales volume lower this fall. On a seasonally-adjusted, regional basis, the Pending Home Sales Index fell everywhere. For home buyers and sellers in Westchester , though, regional data remains too broad to be useful. Housing markets are local, meaning that each block on each street on each city has its own distinct economy. When 9 states are grouped into a single “region”, it’s neither helpful nor relevant to people making buy/sell decisions. That said, the Pending Home Sales Index remains important because it’s about housing, and housing is a keystone of the U.S. economic recovery. The market looks ideal for buyers. Home prices are rising, but slowly; and mortgage rates remain near rock-bottom levels. Home affordability is high and should remain that way for the next few weeks. If you’re shopping for a home, it’s an excellent time to go under contract. Home builders continue to sell homes and work through inventory. According to data from the Census Bureau, the number of new homes sold in September jumped 6 percent from the month prior, beating analyst expectations. On a seasonally-adjusted, annualized basis, buyers in New Jersey and nationwide closed on 313,000 newly-built homes last month. It’s the highest reading since April and a major reason why the available number of new homes for sale is shrinking. 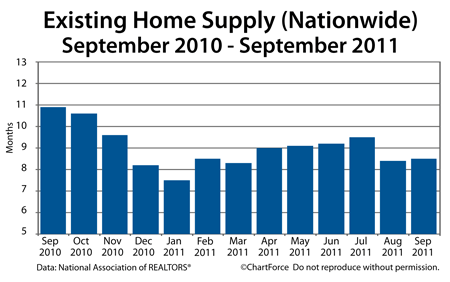 As compared to September 2010, there are 19% fewer homes for sale nationwide. At today’s sales pace, the complete new home inventory would be “sold out” in 6.2 months – the quickest sell-out pace since the April 2010 federal home buyer tax credit expiration. It’s no wonder builder confidence is rising. After averaging 15 through the first 9 months of the year, homebuilder confidence jumped 4 points for October, carried by low mortgage rates and the expectation for a strong winter/spring selling season. For buyers in Manhantten , this could be construed as a housing market-shifting signal. As builder confidence rises, it becomes more difficult to negotiate for upgrades and price reductions on a new home. “Great deals” get scarce. Furthermore, it’s unlikely that mortgage rates will sustain their current, ultra-low levels into 2012. Rising rates lead to higher housing payments on a month-to-month basis. If you’re in the market for a newly-built home, in other words, today’s homes may represent your best value of the year. 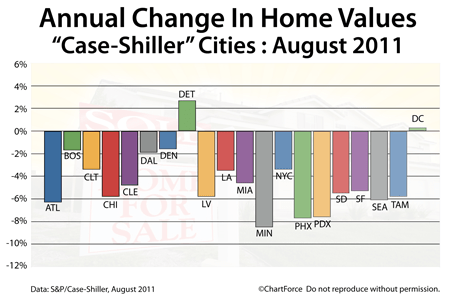 The August 2011 Case-Shiller Index was released this week. On an monthly basis, 10 of 20 tracked markets worsened. On an annual basis, valuation degradation was worse. Only Detroit and Washington, D.C. posted higher home values in August 2011 as compared to August 2010, rising 2.7% and 0.3%, respectively. However, the index has been moving in the right direction. Since bottoming out in March of this year, the Case-Shiller Index is up nearly 4 percent. As home buyers and sellers in Bronx , though, we have to remember that the Case-Shiller Index is a flawed product; its methodology too narrow to be the final word for housing markets. The Case-Shiller Index has 3 main flaws. The first Case-Shiller Index flaw is its relatively small sample size. Although it’s positioned as a national housing index, Case-Shiller data represents just 20 cities nationwide, and they’re not even the 20 most populous U.S. cities. For example, cities like Houston (#4), Philadelphia (#5), San Antonio (#7) and San Jose (#10) are excluded from the Case-Shiller Index findings. By contrast, Minneapolis (#48) and Tampa (#55) make the list. A second Case-Shiller Index flaw is the way in which it measures home price changes. The Case-Shiller Index formula ignores all home sales except for “repeat sales” of the same home. New homes don’t count for the Case-Shiller Index. Furthermore, the index ignores condominium and multi-family home sales, too. In some cities, condos can account for a large percentage of sales. And the third Case-Shiller Index flaw is that the data is reported on a 2-month lag. Next week marks the start of November, yet we’re still discussing data from August. A lot can change in two months (and it often does). Today’s market conditions are similar to — but not the same as — market conditions from before Labor Day. The Case-Shiller Index is far from “real-time”. As a monthly release, the Case-Shiller Index does more to help people with a long-term view of housing, including politicians and economists, than it does for everyday buyers and sellers of Queens who negotiate prices based on current demand and supply. 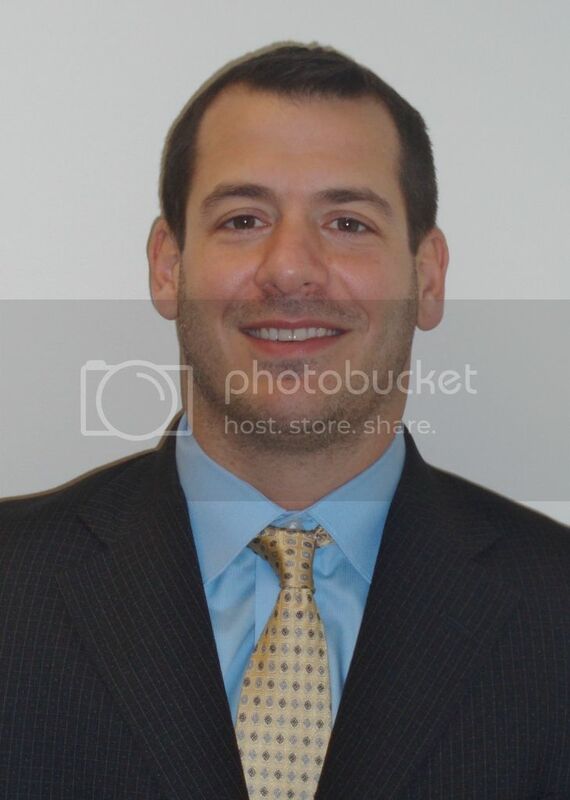 A real estate agent can tell you which homes have sold in the last 7 days, and at what prices. The Case-Shiller Index cannot. The Federal Home Finance Agency announced big changes to its Home Affordable Refinance Program Monday. More commonly called HARP, the Home Affordable Refinance Program is meant to give “underwater homeowners” opportunity to refinance. With average, 30-year fixed rate mortgages still hovering near 4.000 percent, there are more than a million homeowners in Bronx and nationwide who stand to benefit from the program overhaul. Most notable about the new HARP refinance program, though, is that the government is waiving loan-to-value requirements on a HARP loans. Homeowners’ participation in the program are no longer restricted by their home’s appraised value. In fact, the new HARP doesn’t even require an appraisal, in most instances. With the new HARP program, underwater mortgages can be refinanced without LTV limit or penalty. According to the government’s press release, pricing considerations for the new HARP program will be released on or before November 15, 2011; and lenders are expected to be offering the program as of December 1, 2011. If you think you may be eligible, first confirm that either Fannie Mae or Freddie Mac is backing your loan. Both groups provide a simple, online lookup. If your loan cannot be located on either of these two sites, your current mortgage is not backed by Fannie Mae or Freddie Mac, and is not HARP-eligible. The FHFA’s official press release contains an FAQ section. In it, you’ll find minimum qualification standards, as well as information related to condominiums and to mortgage insurance. The HARP program is meant to help a wide group of homeowners, but each applicant’s situation is unique. For specific HARP questions, be sure to talk with a loan officer. When we move into a home, we make changes. Appliances get replaced, rooms get painted, and floors get refinished or recarpeted. It part of how we make a home “ours”. One item we tend to skip, though, is the changing of the doorbell. In most Westchester homes, the existing doorbell is “good enough”. Well, if you’ve ever had a mind to change your home’s hard-wired doorbell system, the good news is that changing your doorbell is a simple, do-it-yourself project. Whether you want chimes, songs, or the traditional ding-dong, all you need is a screwdriver, some tape, and the new doorbell system. The video also includes helpful tips such as how to use tape to prevent “losing” wires in your walls, and how to label your wires for faster re-wiring. Changing a doorbell is a quick, 1-hour project. Use the video’s guidance to make you don’t miss a step. Despite fewer homes for sale nationwide, the number of home resales remains steady. According to data from the National Association of REALTORS®, on a seasonally-adjusted, annualized basis, September’s Existing Home Sales eased by 150,000 units, falling to 4.91 million units nationwide. An “existing home” is a home that’s been previously occupied and, despite last month’s drop, September’s sales volume remains the second-highest on record since April 2011. A contract failure is typically the result of homes not appraising for the purchase price; mortgage denials in the underwriting process; and, insurmountable home inspection issues. Because sales volume is steady, we can infer that more buyers are “in the market” than the final sales tallies would have us believe. This notion is also evident in the Existing Home Supply data. In September, the number of homes for sale fell by 69,000 nationwide. 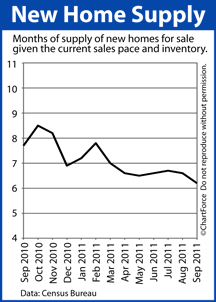 At the current pace of sales, it would take 8.5 months to “sell out” the complete national inventory. This is more than 2 months faster as compared to September 2010 — a major improvement for the housing market and a sign that home prices should rise soon. Today’s Bronx market exemplifies Supply and Demand. Demand for homes is holding steady as home inventories fall. This creates pressure for home buyers to make offers, and multiple bidding situations become more common. Negotiation leverage shifts to the sellers and the result is that buyers pay higher prices for homes. Freddie Mac reports that the 30-year fixed rate mortgage ticked lower this week, averaging 4.11% nationwide with 0.8 discount points. This means that mortgage payments are lower by $46 per $100,000 borrowed as compared to the high-point of the year. You may pay more for a new home, in other words, but you’ll pay a lot less to finance it.